Please note that the content of this book primarily consists of articles available from Wikipedia or other free sources online. 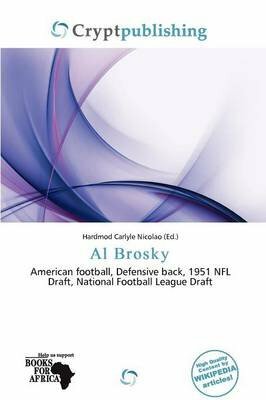 Alfred E. Brosky (June 9, 1928 - November 28, 2010) was a former American football player, and is a member of the College Football Hall of Fame. Born in Cincinnati, Ohio, Brosky played football at the University of Illinois from 1950 to 1952. A defensive back, Brosky set the NCAA record for career interceptions with 29, a record which still stands. He was a member of the Theta Xi fraternity. After college, Brosky played professionally for one season, with the Chicago Cardinals in 1954.